Thank you to all of you who participated in our challenge last week. the design team was blown away by the fabulous creations using the color scheme; from the clean and simple to the bold and beautiful and everything in between. You all rocked this challenge. 1. Joanne's Choice: JoMo's deeply coloured background is the perfect contrast to her delicate florals. 2. Claire's Choice: Cornelia's card made me LOL! Oh Frap! Who doesn't love coffee? Bravo! 3. Elizabeth's Choice: Mary's card is a winner because everyone loves crafty goodness! 4. Annie's Choice: Claire's classic CAS card with those bold, colorful numbers is a stand out! Bravo! 5. Sandy: Tenia's fabulous card has so many delicious layers and textures, I love them all! 6. LeAnne's Choice: Sidan's little wintery scene is sweet, fresh and Christmasy! Congrats! 7. Jan's Choice: Shana's off the page frame and softly coloured birds were winners to me. Lovely card! 8. Nance’s choice: Stef’s smooshed background is a beautiful blend of our colors & the poppies, POP! 9. Laurie's choice:Jessie's flower spray is beautiful and really showcases the challenge colors! 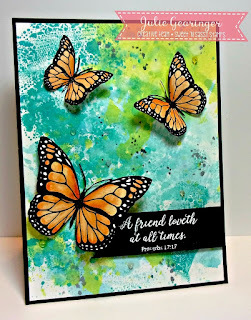 Julie's smooshed background is beautiful and I love the random feel of the background with the beautiful forms of those gorgeously colored butterflies and the white on black sentiment. The black mat frames this beautiful composition together beautifully. Julie, I can't say enough about this absolutely beautiful card. Congrats on being my headliner this week. Thanks, Claire, for picking my card! You made my day! Congrats to all the other winners, especially Julie! Congrats to the challenge winners and the headliner. Julie's card is truly beautiful. Can't wait to see what the team comes up with tomorrow! Danke. Thanks for picking my card!! Congrats to the others.